The holiday shopping season is in full swing and busy shops mean businesses racing against the clock to meet demand and fill orders quickly. 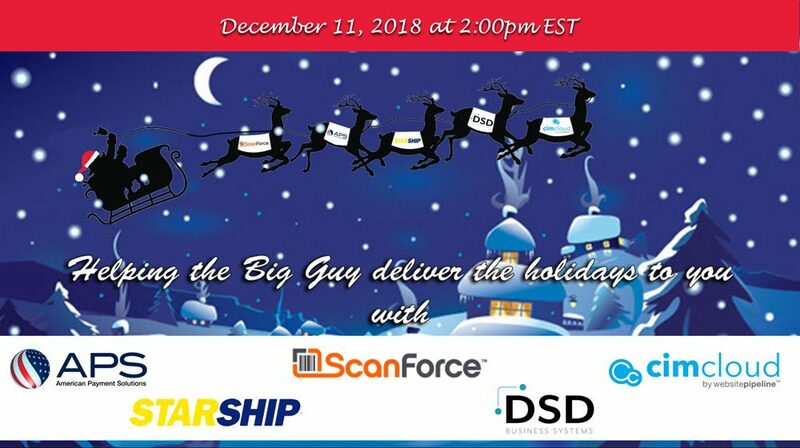 In this 1 hour webinar, we’ll share 5 ways to streamline holiday order placement and fulfillment just in time for the rush by walking you through the life-cycle of an order from the time it’s placed to when it leaves the dock and payment is received. Easy, convenient placement of B2B and B2C orders on an online portal with CIMcloud by WebsitePipeline. Simple but robust document management for sales orders with Instadocs by DSD. Quick order turnaround facilitated by mobile picking, packing, and staging by ScanForce WMS. Streamlined international shipments and automatically generated associated documents with StarShip by V-Technologies. Easy, automated payment processing with APS and Click2Pay. From the time an order is placed to the time its picked, packed, shipped and even up until the time the payment is received – these joint add-on solutions for Sage 100c can automate your processes, helping you sell more, sell faster, and do it all efficiently and accurately. Fast and accurate for you. And everyone has a happy holiday season!